Bear Naked Custom Granola is where you can blend your very own custom made, Bear Naked Granola. You can have it delivered straight to your front door for free. How fantastic is that! 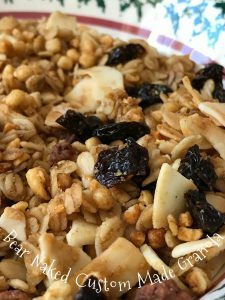 Bear Naked Custom Granola offers you a wide range of ingredients from the traditional dried fruits, dark, milk or white chocolate, nuts and coconut. To the more non-traditional ingredients such as freeze dried jalapeno slices, dried lavender and green tea matcha powder. Everything available at Bear Naked Granola is Non-GMO Project Verified too. Given the Opportunity to Make My Own.. 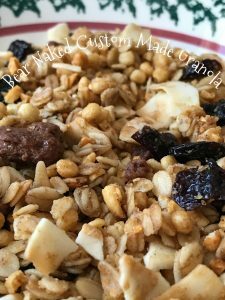 I was offered the opportunity to try “blend builder” and to create my own unique custom blend of Bear Naked Granola. In exchange for my review, I was awarded with my very own, custom made blend of granola. You also get the chance to “name” your granola, which I think is a really fun idea. I have been a huge fan of Bear Naked Granola for a long, so I couldn’t wait to get blending. 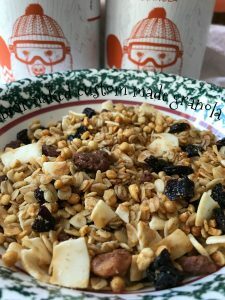 Making my own custom granola using blend builder was really easy and lots of fun. Plus, your custom granola comes in a really cool canister and box. It’s as easy as 1, 2, 3, to create your own custom granola. Step 1: You will need to choose a base granola; Cacao + Cashew Butter, Chocolate or Honey. Step 2: Gather your ingredients; you can choose up to 3 ingredients. (from over 50 available) Drag and drop your selections from the categories; Curated, Bare, Fruit, Sweet & Spices and Nuts. Step 3: Select a Bear to be featured on your canister. Choose from Frank, Earnest, Susan, Britney, or Bodie OR you can Bearify Yourself! Step 4: Name & claim your blend. 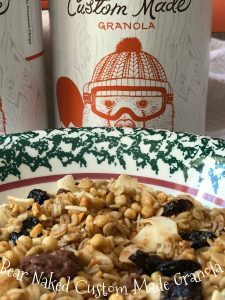 Now is’s time to finish you custom label and give your granola a name. The name you choose will appear on the side of the canister. That’s it!! You will then be taken to your cart to check out. Your customize canister and custom granola creation will be shipped to your door (for free). 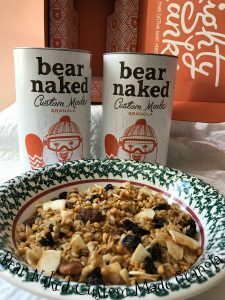 Bear Naked Custom Granola is the perfect gift for that hard-to-shop-for person on your Christmas list but it’s perfect for birthdays, anniversaries, and Valentine’s Day too. You could name each custom blend after those hard to shop for family members or that friend who seems to have everything. What about teacher gifts? Bear Naked Granola makes great teacher gifts too. 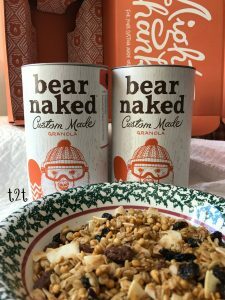 I know, I asked the two teachers in our family:) Bear Naked Granola comes in the best packaging I’ve ever seen, all you’ll have to do is wrap the box it comes in or put it into a holiday gift bag. By purchasing Bear Naked Custom Granola and you can check off one more thing on your Christmas “to do” list. 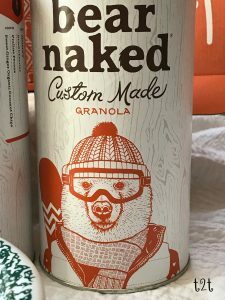 To create your own granola, with over 50 different ingredients to choose from, go to Bear Naked Custom Granola and create your own unique, custom made granola blend. 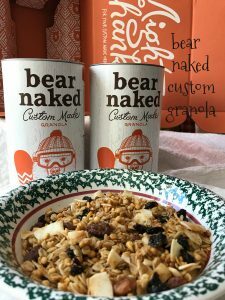 Bear Naked Granola has everything you need to start blending. Live A Little…Get Nuts and Go Wild! Get 10% Off Your First Bear Naked Custom Made order!